A closer view of the Wuzhen Road Bridge. We can see the Datong Road Bridge (a blue, single span deck arch) just below its soffit. 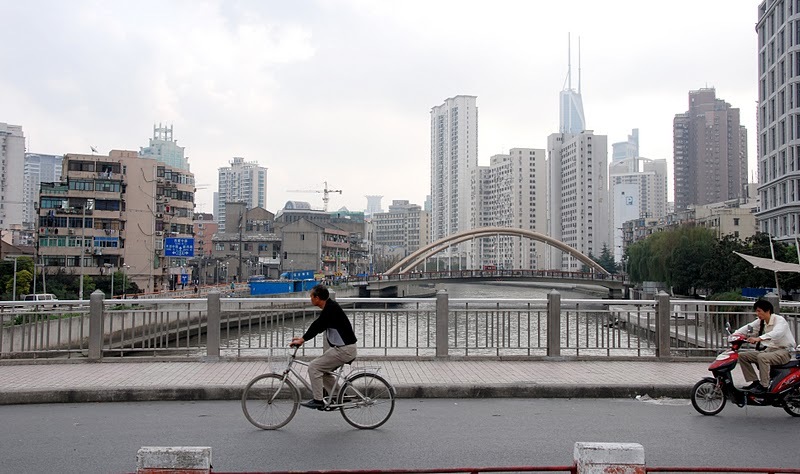 Because Wuzhen Road Bridge is a tied arch, it sits on seat-type abutments. The Datong Road Bridge is a deck arch, which relies on the substructure to carry the longitudinal thrust, and requires diaphragm-type abutments. Both bridges have wide sidewalks and several traffic lanes. Shanghai China's Bridges: Wuzhen and Datong Road Bridges by Mark Yashinsky is licensed under a Creative Commons Attribution-NonCommercial-ShareAlike 3.0 United States License.